So one of the things I put into my new theme Tender Spring is the post thumbnail support. The theme handles the image that you set as post Featured Image on the post in a special way. It puts a circle around it and adds a leave. I’m sure it’s not a new concept but heck I thought of it while designing the theme so I want to share my new revelation! the_post_thumbnail() doesn’t really give the flexibility I need because I don’t want the img tag but rather just the url for the post thumbnail file. I wrapped two layers over the img. I made the img not display but used the background image from the first layer with border-radius to get the circle affect. The inner layer is used to overlay a background image on top of the outer layer. This image is the leaf you see. 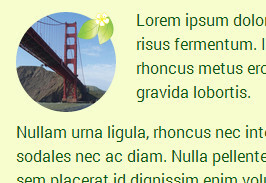 This technique depends on the CSS3 background-size & border-radius which should now be supported by your latest versions of FF, Chrome and even IE believe it or not.